I love, love, love this material. It's absolutely gorgeous. I got it off my mam who got it off her Turkish mother-in-law, my Babaanne. She didn't really like it, she said it looked like village material lol, so it sat in her stash pile until I went to visit and ransacked her cupboard and saved it. Ok so she gave me it but my way sounds more fun and dramatic. 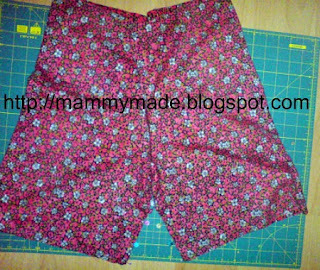 These ones are pretty good although they're a bit too high waisted for my liking, the first pair I made were too hipstery so I added some length on the waistband but I definitely prefer them hipstery so have cut most of it back off my pattern again lol. So to make these shorts all you have to do is take your shorts pattern and lay it out over your material. Cut one side with the pattern facing up and one piece with the pattern facing down. You then want to pinch where the side seams would be and pull them out to each side. You have nearly got a pair of shorts!! Next, you want to sew up the legs and crotch. I reinforced the crotch just in case. Just stitch back and forward a few times. That's the last place I'd want a hole in my shorts lol. 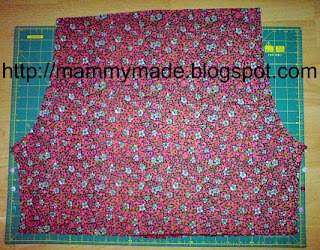 Fold up a hem on each leg and stitch in place. I decided to have my hem showing on the outside so I turned my shorts right way around, folded up about 3/4" on each leg and then folded up another 3/4", stitched it all down with a straight stitch close to the edge, then another a little further down. 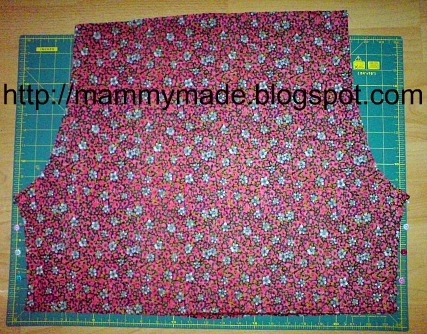 To do the waistband, fold over 2" and stitch all the way around, leaving an inch or two at the back unstitched. That's where you're going to put your elastic in through. Take a piece of elastic the same length as your waist. Pin one end onto a safety pin then use your safety pin to get the elastic through your waistband. Once you've gotten it all through stitch the two ends of elastic together, overlapping them about 1/2". Stitch your waistband shut.